Analyst Chris Whitmore of Deutsche Bank analyzed a possible financial outcome if Apple were to increase its existing share buyback plan. In his scenario, another $50 billion worth of shares purchased at an average price of $500 would add about $4.25 in earnings per share in the company's fiscal year 2014. In Whitmore's estimation, that would be an increase of about 10.5 percent over the year. He believes Apple's current $140 per share of net cash would be enough for the company to undertake such a strategy. In addition, a $50 billion buyback at $500 per share could be self funding, the analyst believes. He noted that interest expenses on debt needed for the buyback would be about $1 billion  an amount that would be offset by dividend payments reduced by $1.2 billion, thanks to retiring dividend-bearing common stock. For those reasons, Whitmore agrees with Icahn, who revealed he spoke with Apple Chief Executive Tim Cook last week, and advised him to buy back more stock. Icahn didn't publicly disclose just how much stock he believes Apple should buy back, but the company's current plan calls for it to repurchase $60 billion worth of shares through 2015. 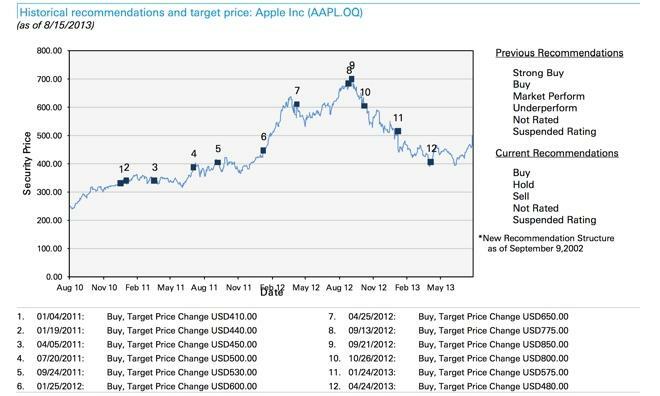 Icahn also said he is bullish on AAPL stock, and has invested $1.5 billion into the company. The support from Icahn, as well as growing hype over an anticipated iPhone event on Sept. 10, helped push shares of AAPL north of $500 last week. Whitmore's projections published on Monday are somewhat similar to those of Amit Daryanani of RBC Capital Markets, who said last week he believes Apple could nearly double its current $60 billion share buyback program. Daryanani's estimates see that strategy adding about $4 to Apple's fiscal year 2014 earnings per share, representing an increase of about 10 percent.